Patch 5.4 brought no changes for Guardians, specifically, but the general changes are interesting. You now have more health, your Vengeance changed (more threat, less damage,) and Nature’s Swiftness (if you used that talent) is gone. Details here. Patch 5.2 provided guardians with some survivability buffs, 5.3 improved your Mastery. Details are here. This page focuses on Guardians as tanks in a PvE (raiding) environment. For Druid leveling or PvP see the links just below. This Guardian Druid guide is primarily intended for use in tanking PvE instances and Raids at level 90. However, the principals will still apply during the leveling process. If you’re looking for advice on leveling your Druid, check out our Druid Leveling Guide. Our choices are checked, . There are situations where you might want a different talent. They’re easy to change and you will need one Tome of the Clear Mind for each change you make. Feline Swiftness is an overall speed increase, useful for chasing after targets that aren’t chasing you instead. Displacer Beast is great for times when you feel like quickly traveling 20 yard, shifting into Cat Form, and getting a brief speed increase. Hopefully this is never. Wild Charge lets you charge and stun an enemy (despite what the tool tip says,) a decent way of opening a pull or swiftly reaching a target at a distance. Flexibility, emergency heal, or HoT? Your call, depending on your needs. In a big patch 5.4 change you no longer have any access to Nature’s Swiftness. The new choice (below) is a pretty interesting repalcement. Ysera’s Gift will be a great thing for your survivability, especially with your massively buffed (rading) health pool. Renewal is a self-heal that also scales well with our massive life pool. It’s a nice “Oh, Crap! !” button every two min. If you’re in no danger of being crushed then one of the others will be a better choice. Cenarion Ward is a six second Heal Over Time which activates on damage. 30 second cooldown. A good choice if you don’t need to heal a lot right now, but Ysera’s Gift looks better. Faerie Swarm replaces Fearie Fire and is be useful for slowing down or kiting opponents. You’ll likely be using Faerie Fire anyway unless another Druid is providing it, Fearie Swarm just improves it. Mass Entanglement is useful CC for any fight that requires it. Typhoon knocks targets away from you, which is generally the opposite of what you want as a tank, though it can set you up for a charge. Soul of the Forest helps out your rage generation by boosting the rage you gain from using Mangle. Incarnation: Son of Ursoc is a great cooldown for taking and holding threat as well as building rage, survivability, and anything else you can imagine. Still, it has a 3 minute cooldown, decide whether you’d rather have the burst threat/rage or the constant rage increase from Soul of the Forest. Force of Nature summons one treant, which taunts your opponent and melees it. It does have a one minute cooldown, which doesn’t make it any less useless. Disorienting Roar might have some utility in slowing down a group of adds you need to pick up threat on, but I’d still prefer the other options in this tier. Ursol’s Vortex is a nifty ranged AoE slow that could come in handy for controlling a group of mobs. Probably more useful in PvP. Mighty Bash is a 5 second stun. It’s on a mediocre cooldown and stuns don’t effect bosses, but they’re otherwise very useful. Heart of the Wild is a very choice in this tier just for the passive boost it provides. You’re not likely to be out of bear form for anything important, but the stat boosts are nice. Dream of Cenarius was less useful before, but in 5.4 it increases the amount healed by Healing Touch by 20%. Increases the critical strike chance of Mangle (Bear) by 10% and critical strikes of Mangle (Bear) have a 40% chance to make the next Healing Touch or Rebirth instant, free, and castable in all forms. Instant cast version of Healing Touch now benefits from Attack Power instead of Spell Power. Nature’s Vigil is a very decent cooldown for the healing and damage it adds. Patch 5.2 cut both the cooldown and the buff in half. Patch 5.4 buffed it, so now you get an added 12% to all damage done plus some passive healing of your allies isn’t at all a bad thing. The 1.5 minute Vs 6 minute cooldown (of Heat of the Wild) is what makes it the pick of this tier. Glyphs can be easily changed and each change requires one Tome of the Clear Mind, just as with talents. Glyph of Might of Ursoc is an option if you feel it benefits you on a particular encounter. Glyph of Frenzied Regeneration could certainly come in handy at times, providing a healing boost similar to Vampiric Blood instead of actual direct healing. Glyph of Stampeding Roar is a boon if your raid requires the movement speed boost. Glyph of Rebirth is almost essential during encounters to avoid the target being killed instantly after resurrection, but someone else should be handling the rezzes. Glyph of Maul is useful in certain AoE situations, but only rarely. Glyph of Fae Silence – Adds a silence to Faerie Fire, and a 15 sec cooldown. Glyph of Grace – less falling damage when jumping off things. Glyph of the Chameleon – If you like pretty colors. Glyph of Aquatic Form – For all the wet stuff out there. Hit & Expertise > Crit >> Ag > Haste > Mastery > Dodge >> excess hit/Exp. Weapon: The best 2-handed Agility weapon you can get. Stamina: Make sure you have enough that your healers have to to take care of you. You should be able to survive at least two hits. Hit & Expertise: if you’re not hitting you’re not doing damage or threat or proccing abilities. A lot of your Rage comes from successful attacks, so misses will be bad. Expertise applies to your opponent’s Dodge and Parry, 15% eliminates both. Crit – Your Primal Fury ability lets your Mangle and auto-attack crits generate an extra 15 Rage. Crit is considered a much better rage generation stat than Agility. Haste lets you make more attacks in any unit of time which results in that much more threat and rage. Mastery was buffed in 5.2 for more armor, and again in 5.3. This helps to smooth out incoming damage and makes life easier for your healers (and you.) This and your health pool should keep you up long enough for your healers to take care of you. Dodge: The opponent’s missed strikes do no damage to you, but smoothing out the damage that you are taking (by stacking the other stats) is more important. Make sure you have that 7.5% Hit and 15% Expertise. If a piece of gear already has Hit then reforge the other stat to Expertise. Reforge all other stats to Crit. 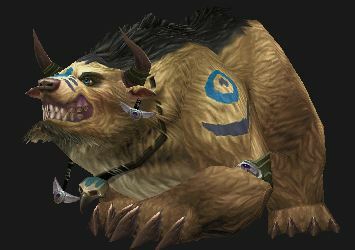 With the changes to Bear Druid tanking in Mists of Pandaria your rotation is primarily focused on generating enough rage to use your defensive abilities. Core to this is Mangle which is now your primary rage generation ability along with auto-attacks which grant extra rage when a critical hit. Rage generation is increased by your attack speed, hit chance, and expertise as the more often you land a strike the more rage you’ll generate. Critical strikes with Mangle or an Auto-Attack grant an additional 15 rage due to the Primal Fury passive. Growl, our taunt, lasts for 3 seconds and has an 8 second cooldown. Your highest priority is now to use Mangle whenever possible to generate rage. Lacerate, Thrash, and Faerie Fire all have a 25% chance to reset the cooldown on Mangle and you should use Mangle whenever this effect occurs. Faerie Fire should be applied to your target and refreshed whenever necessary. The bleed effect from Thrash should be applied to and refreshed on your target. Lacerate should be used as often as possible to stack the bleed effect and refresh Mangle. Maul is rarely worth using due to the rage cost and should be avoided unless you’re in danger of capping out on rage. When facing multiple targets, apply Thrash‘s Bleed effect and continue to use Mangle whenever possible while target swapping to ensure you build sufficient threat on every target. Swipe replaces Lacerate as your damaging ability of choice. Vengeance increases your attack power by 2% of the unmitigated damage you take, lasting for 20 seconds. Shifting into Cat Form will remove this effect. Berserk is your best threat and rage generation cooldown as it removes the cooldown from Mangle and causes it to hit up to 3 targets for 10 seconds. This is the best way of taking and holding aggro on multiple target pulls as well as generating an initial burst of rage for use on various defensive cooldowns if necessary. Savage Defense operates on a charge system, allowing you to store up to 3 charges maximum. Savage Defense lasts for 6 seconds each time it’s activated and has a 9 second cooldown per charge. Might of Ursoc increases current and maximum health by 30% for 20 seconds with a 3 minute cooldown. Using the Glyph increases the health granted by Might of Ursoc by 20% but increases the cooldown by 2 minutes. Frenzied Regeneration converts up to a maximum of 60 rage into health and has a 1.5 second cooldown. Using the Glyph causes it to always cost 60 rage and no longer convert rage into health but instead increase healing received by 40% for 6 seconds. The Glyphed effect is best used in immediate advance of heavy damage to allow time for you to benefit from the increase in healing received. Survival Instincts reduces all damage taken by 50% for 12 seconds on a 3 minute cooldown. Barkskin reduces all damage take by 20% for 12 seconds on a 1 minute cooldown. Incarnation: Son of Ursoc should be used whenever you need additional rage and/or threat as it reduces the cooldown on all your melee abilities and Growl to 1.5 seconds, allowing you to spam attacks for 30 seconds. The cooldown on Incarnation is 3 minutes. If you need the gold to buy gems, then you should check out this slick gold making addon. The gems with secondary stats have twice the value of the Agility gems, eg: 320 Crit Vs 160 Ag. Since Crit is already better than Agility for tanking purposes then you should skip any and all AG gems in favor of Crit. Meta: Agile Primal Diamond for the extra damage (threat) and a tiny bit of extra crit. Go with the Austere gem if you need the defense, though. If you need Hit or Expertise then consult the table and gem appropriately. The Engie helm is a nice starter helm, if you have Engineering. Cogwheel Smooth Tinker’s Gear: 600 Crit – requires an engie helm, such as this. While most of these are defensive enchants, there are a few to add some firepower. Some Hit enchants are shown if you still, somehow, need that stat. Head enchants do not exist, all shoulder enchants come from the Inscription profession. Ranged Weapon You don’t use no stinkin’ ranged weapons. Weapon Enchant Weapon – Dancing Steel: Sometimes add 1,650 Ag when striking. Enchant Weapon – Windsong: Sometimes increase Crit, Haste, or Mastery by 1,500 for 12 seconds. Cloak Swordguard Embroidery: Sometimes pops 4k AP for 15 sec. Requires Tailoring. Bracers Fur Lining, Agility: 500 Agility, requires Leatherworking. Socket Bracer: Self only, Blacksmithing, pop in a nice Agility gem. Socket Gloves – Self only, Blacksmithing, pop in a nice gem. Belt Living Steel Belt Buckle: put a nice gem into this slot. Boots Enchant Boots – Blurred Speed: 140 Agility and Slight run speed increase. All food buffs last one hour and provide only one stat. Foods are available that provide secondary stats, but they’re only worth about 200 points. If you have the Alchemy skill the effect and duration of flasks and elixirs will be increased, including the value of secondary stats, by about 30% and an hour. Virmen’s Bite: 4k Ag for 25 seconds. If you pop one immediately before combat you will be able to pop another during combat. Recommended: Elixirs – you can have one battle and one guardian elixir up at a time. The Crit and armor are much more valuable than either the Ag or the Stam. Druids are the most exclusive of all classes, there are only four races to pick from. Mists of Pandaria made no changes to races and very few to the racial abilities and there are no Pandaren Druids. Tauren – Maybe the best tanks, due the the increased health and the stomp. Increased health (about 5%, about 20k for a 400k health pool,) but doesn’t seem to scale well at very high levels. Can periodically move quickly, which is useful. Increased crit chance is nice, since Crit is a great stat for you. Berserking increases attack and casting speed. Damage increased Vs beasts, all 5 million of them, which is nice while leveling and will have some use Vs beast mobs in dungeons and raids. Ranged weapon Expertise is a useless ability for Guardians. Reduced duration of movement imparing effects, useful for most, but your shapeshift is a far superior “break free” ability. Night Elf – Not much going on here. Shadowmeld has situational use. You fade away, dropping aggro, but must remain stationary. Only useful if you’re tired of your team and you want the boss to smash all of them. 2% dodge is a nice ability for you. Faster movement while stealthed is nice when prowling, but it has no use in tanking. All of the professions provide some benefit for any class/spec, though clearly some are better than others. Even the gathering professions have some value, though you might be better served by using those to build a larger gold stash. Most of the professions add an average of about 320 Agility. Since gems with secondary stats are twice the value of those with primary stats (320 Mastery Vs 160 Int, for example) Blacksmithing is easily the most valuable profession since you can slot 640 Crit as opposed to 320 Ag. Herbalism gives you a very nice Haste cooldown and you can find spirits, which may come in handy at times. Blacksmithing gives two extra gems slots. Since gems with secondary stats have twice the value of gems with primary stats Blacksmithing might be a very valuable profession. For example, you’ll be able to socket he two gems for 640 Mastery or 480 Stam instead of 320 Ag. Jewelcrafting Make nicer gems for your own use. Enchanting Enchant both rings, for a total +320 Ag or Stam gain. Inscription Shoulder enchant adds 520 Ag and 100 crit or 750 Stam with 100 Dodge. Alchemy More effect from your own potions. Adds 320 Ag and an extra hour to your main flask. Engineering has lots of interesting toys, some of which have situational use, and Synapse Springs, which increases Ag by 1940 for a short time. If you take this use a macro to activate it along with other short term buffs. Leatherworking Bracer enchant adds 500 Ag., another adds 750 Stam. Tailoring Cloak enchant sometimes adds 4k Attack Power for 15 seconds. Herbalism Small heal and 2880 Haste for 20 seconds. The life and water spirits found while flower picking are also very nice. Guardians are fine tanks and while you can level all the way to 90 in the dungeon system sometimes it’s nice to step ouit into the world and do some questing. Or maybe you’re leveling another alt who doesn’t get your tank’s instant-queues into the dungeons. Either way, you’re looking at a lot of quests and a pretty fair amount of time. Wouldn’t it be great if you could do that a lot faster? You can. You will save you many days of in-game time and also save a good deal of frustration, even if you already know many or most of the quests. How? By using Zygor’s Guide. 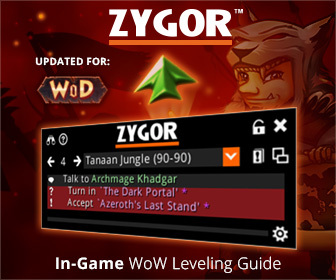 Zygor’s automates the whole leveling path, showing you exectly where to go and what to do every step of the way to 90, automatically updating as you complete tasks and quests, and is like having an expert helping you every step of the way. Pick your starting point, regardless of your level, and the guide automatically updates and advances as you complete quests, sets a waypoint arrow automatically, and includes all the important quest info. Want to step away from questing to dungeon level or PvP? No problem. Zygor’s is smart enough to detect your level and update appropriately. It’ll even clean up your obsolete quests. You will probably never need to look at your quest log again! Just thought I’d stop by and share my bear stuff on my blog. Specifically Guardian stat weights and spreadsheet. just a slight bit of information you forgot in regards to stam. because stam buffs your vengence stam actually helps raise AP and subsequently your SD as well.